This eBook provides up-to-date guidance for selecting a Product Data Management (PDM) system or service for an engineering organization. What is Product Data Management (PDM)? Today, we’re in an era of change for Product Data Management. New needs and technology revolutions are driving new and interesting capabilities into this long staid class of server-based IT systems. With new capabilities come new considerations for selecting the right PDM solution for your organization. This eBook provides guidance on how to select such a PDM system. It offers a process or procedure to follow. It details criteria to include on your list. It delivers a worksheet you can user o grade and compare PDM systems. 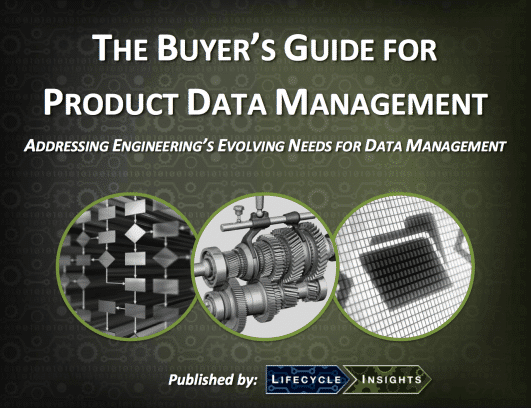 It is the Buyer’s Guide for Product Data Management. For IT Managers, this eBook provides insight into the key capabilities needed to support the engineering organization. For Engineering Managers and Directors, this eBook provides a broadened set of capabilities that should be considered, given the recent changes to PDM systems and services in the last few years. …here’s the catch: every class of technology undergoes an era of innovation and disruption. For PDM systems, we’re in such an era today. Consider the need to manage multi-CAD data. Practically every modern engineering organization has to exchange design data in a wide variety of CAD formats with their suppliers, partners and customers. Employing a PDM system that understands one CAD format extremely well and treats all others as foreigners no longer works. On another front, today’s engineers must take broader enterprise considerations into account during design. That translates into getting non-technical users from manufacturing, suppliers, service and other organizations access to designs without burdening them with CAD applications. In addition to new organizational needs, today’s era of change for PDM systems is also driven by the disruption occurring in other IT areas. The explosion of social technologies has changed users’ expectations in terms of easily sharing and accessing information. The proliferation web tools sitting in the cloud, where flexible compute resources are readily accessible and applications are provided with always-on access are other influential trends. Also, with the increasing acceptance of the Bring Your Own Device (BYOD) in work environments, business solutions are increasingly mobile ready. All of these changes and more reframe the criteria that should be considered when selecting a PDM system. Ultimately, that is the purpose of this guide.